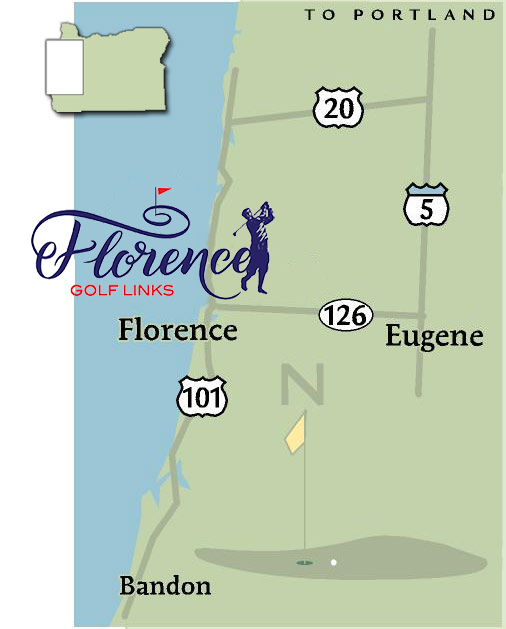 Florence Golf Links is conveniently located 1/4 mile West of Hwy 101 in Florence, Oregon. If traveling from the Portland or Eugene area take Exit 195 from I-5, and travel West about 1hr on Hwy 126. Upon arriving in Florence, Highway 126 intersects with Highway 101, which runs North & South through Florence. Florence Golf Links is to the North (right turn). Then turn West (left) onto 35th Street (traffic light), and after 1/4 mile, the Florence Golf Links entrance is on the right. From Florence Golf Links is an easy 80 minute drive south to Bandon or or 80 minutes north to Lincoln City. Florence is accessible by air at the Florence Municipal Airport (Unicom 122.8, runway length 3000' x 60'). Please call 541- 997-1940 for more information.